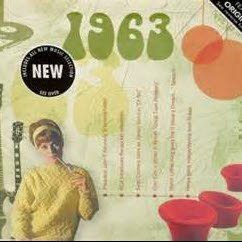 The two-fold card, together with the included 20-track compact disc featuring many of 1963's top artists and biggest hits, evokes a real sense of the year. Celebrate a year of birth, year of marriage or any other anniversary or special day with this ideal Card and Gift in one. 1. Bob Dylan - Girl From The North Country. 2. Elivs Presley - (You're The) Devil In Disguise. 3. Roy Orbison - Blue Bayou. 4. Bobby Vinton - Blue Velvet. 5. Duane Eddy - Boss Guitar. 6. Johnny Cash - Ring Of Fire. 7. Aretha Franklin - Until The Real Thing Comes Along. 8. Percy Faith - On Broadway. 9. Little Peggy March - Hello Heartache, Goodbye Love. 10. Marty Robbins - Ruby Ann. 11.Dion - This Little Girl. 12. Skeeter Davis - The End Of The World. 13. Tony Bennett - The Good Life. 14. Neil Sedaka - Let's Go Steady Again. 15.Johnny Mathis - What Will My Mary Say. 16. Los Indios Tabajaras - Maria Elena. 17. Jim Reeves - Welcome To My World. 18. Duane Eddy - Lonely Boy, Lonely Guitar. 19. Roy Orbison - Falling.